Alipoor is accompanied on stage by a desk covered in monitors, behind an opaque projection screen sits a second, silent performer, seemingly standing in for the shadowy online influences referred to throughout the show. 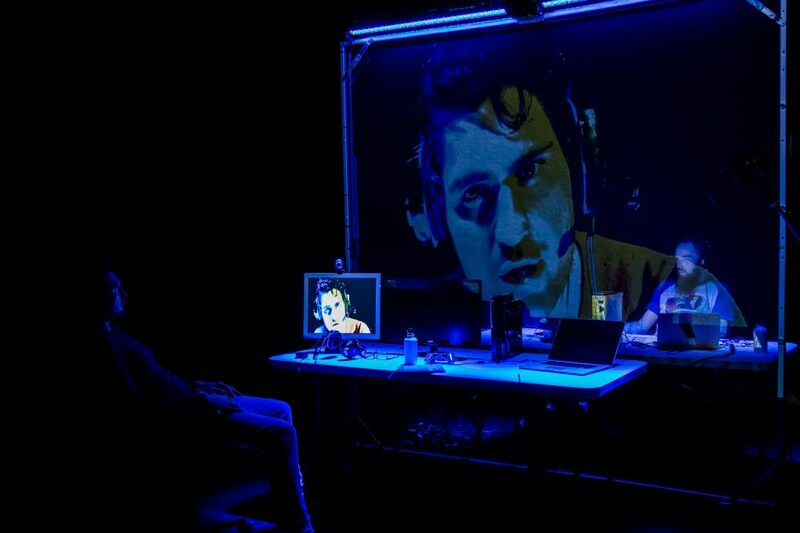 Alipoor utilises various modes of performance, switching between third-person narration through a standing microphone, to a projection of his webcam, to conversational speech directed straight to the audience. Multiple themes are explored, primarily the depersonalising effects of the internet and how this escalates the spread of radical ideologies, which Alipoor identifies as a distinctly male phenomenon. The show also delves into the inflammatory material shared on social media, and how meme culture has blurred the lines between irony and sincerity in online communication. He details the process of “De-individuation” and finds parallels between the sexist vitriol unleashed by Gamergate, the ascendant political clout of the alt-right, and the cunning influence of ISIS propaganda, illustrating how extremism is enabled and empowered by online anonymity. Much of the show takes the form of an educational lecture, perhaps out of necessity given that the show doesn’t just attempt to tie together three separate character strands and their historical, political and geographical contexts, but also includes detailed explanations of some of the internet’s more obscure memes and esoterisms. Including reference to a bizarre semi-ironic attempt to trace the online slang term “kek” to an ancient Egyptian hieroglyph, which apparently became a viral sensation in the shadowy corners of 4chan’s message boards. These deviations, although interesting and providing wider context, overburden an already convoluted narrative, to the extent that even at the halfway mark, the show still seems to be clarifying it’s component parts. A further layer, while providing the productions most distinctive and interesting feature, only adds to the confusion, is the fact that on entry the audience is invited to join a Whatsapp group and are encouraged to use their phones throughout the show’s duration. Occasional provocative pieces of text are drip-fed in the chat; extreme Islamist propaganda, inflammatory sexist diatribes, alt-right calls to arms. However, these expository elaborations cannot compete with the far more engaging messages of the audience, which alternate between expressions of befuddlement, sardonic commentary, comic reaction gifs and the occasional shameless attention seeking. The show’s most memorable moments are when the chat becomes the focus, such as when Alipoor asks the audience to list “The worst thing you’ve seen online” causing a tangible frisson in the auditorium as we wait to see just how far the audience will go under the veil of relative anonymity. It’s an effective device that illustrates just how easily deindividuation seduces us into disruptive behaviour, but yet again it renders the events on stage as context to the real show, taking place on our phone screens. Unfortunately, there comes a point when I give up on following the narrative, my attention too stretched by the more subversive events unfolding in my hand. Perhaps this is the point, how experience is fragmented, and filtered through technology to the extent that reality becomes irrelevant, but the attention given to narrative detail makes me suspect this is not fully intended.